Does Economic Marginalization Breed Radicals? 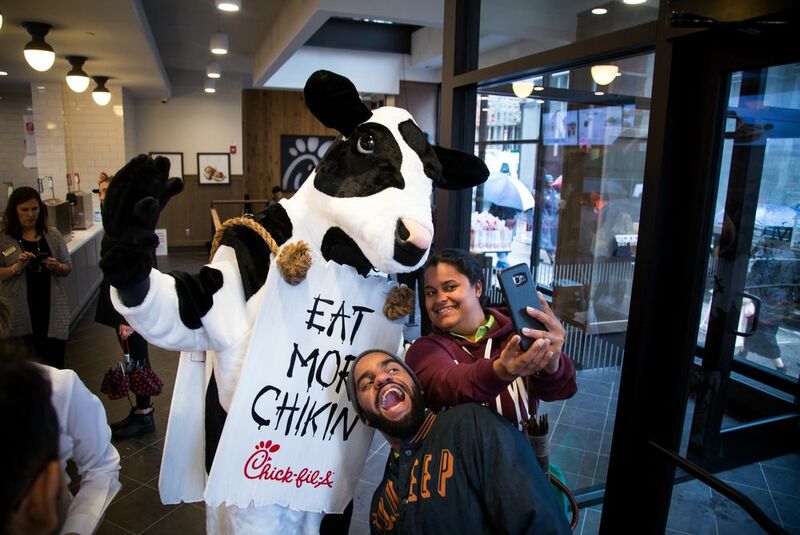 A few years ago, I linked to a Wall Street Journal op-ed by economist Hernando de Soto that declared “economic hope” to be “the only way to win the battle for the constituencies on which terrorist groups feed.” A couple years later, I discussed the possibility that strict labor laws–and the unemployment it produces–was a major contributor to radicalization in Europe. In short, the lack of economic opportunity breeds extremism. Recent evidence appears to support this hunch. Although U.S. drone strikes in Muslim countries might play a role in the radicalization or violent extremism of co-religionists around the world, the available evidence does not support the assertion that drones are “fueling the fires of homegrown radicalization” in Western societies or that these unmanned aerial vehicles are the new Guantánamo. …The radicalization of individuals in the Somali diaspora, especially in the state of Minnesota, illustrates the role of U.S. policies targeting Muslim communities at home; personal factors, such as conflicted identities among young Somali Americans; and their nationalist desire to evict foreign troops from Somalia, a desire that recruiters from the al-Qaida affiliate al-Shabaab have been able to exploit. My brief examination of the social science literature on the drivers of Islamist militancy among Muslims in European countries similarly points to domestic factors such as an identity crisis among some young Muslims, state policies of marginalization and discrimination, and the role of radical preachers and terrorist recruiters who leverage these vulnerabilities for recruitment (pg. 83-84; emphasis mine). Exploiting individual-level education information for these fighters, we link the size of a contingent of fighters to the economic conditions faced by workers in their countries of residence who have the same level of education, by distinguishing primary, secondary and tertiary education. Beginning non-parametrically, we document a correlation between the within-country relative unemployment rate faced by workers from a specific country and education level and the corresponding relative number of recruits. We then conduct panel regressions in which we estimate the impact of unemployment on the propensity to join the terrorist group, controlling for country and education-level fixed effects. The estimated coefficients indicate that higher unemployment rates are a push factor towards radicalization, especially for countries at a shorter distance to Syria, with an elasticity of 0.25; a one percentage point increase in the unemployment rate leads to 42 additional Daesh recruits. The elasticity steeply decreases further away from Syria and becomes both economically and statistically insignificant past the average distance of 2,500 km. The results are robust to the inclusion of education-specific wage rates, strengthening the case for a causal interpretation of these results (pg. 1-2). I’m reminded of the famous quote by Nobel laureate Robert Lucas: “The consequences for human welfare involved in questions [of economic growth] are simply staggering: Once one starts to think about them, it is hard to think about anything else” (pg. 5). …The survey questions that mention the Bible do not specify any particular verses or translations, leaving that up to each respondent’s understanding. 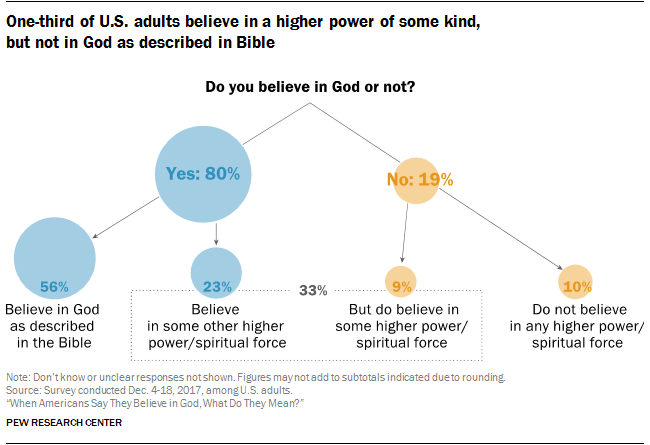 But it is clear from questions elsewhere in the survey that Americans who say they believe in God “as described in the Bible” generally envision an all-powerful, all-knowing, loving deity who determines most or all of what happens in their lives. 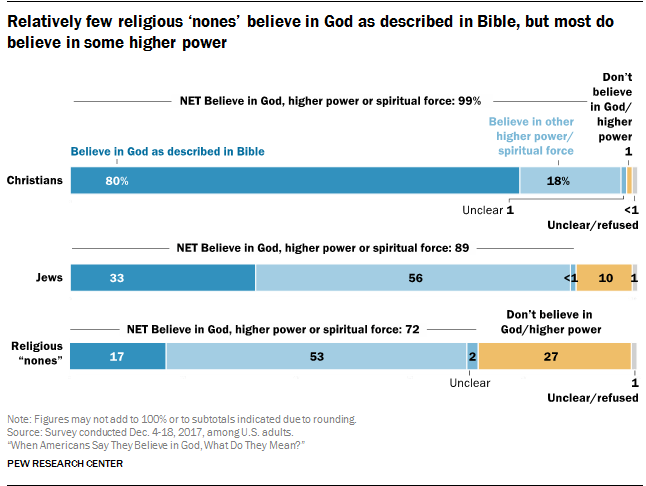 By contrast, people who say they believe in a “higher power or spiritual force” – but not in God as described in the Bible – are much less likely to believe in a deity who is omnipotent, omniscient, benevolent and active in human affairs. The world is more religious than it has ever been. Around the globe, four out of every five people claim to belong to an organized faith, and many of the rest say they attend worship services. In Latin American, Pentecostal Protestant churches have converted tens of millions, and Catholics are going to Mass in unprecedented numbers. There are more churchgoing Christians in Sub-Saharan African than anywhere else on earth, and China may soon become home of the most Christians. Meanwhile, although not growing as rapidly as Christianity, Islam enjoys far higher levels of member commitment than it has for many centuries, and the same is true for Hinduism. In fact, of all the great world religions, only Buddhism may not be growing…[D]espite [the] confident proclamations about the decline of religion, Pew’s findings were certainly misleading and probably wrong. Consider only one fact: the overwhelming majority of Americans who say they have no religious affiliation pray and believe in angels! How irreligious is that? The [Pew] findings would seem to be clear: the number of Americans who say their religious affiliation is “none” has increased from about 8 percent in 1990 to about 22 percent in 2014. But what this means is not so obvious, for, during this same period, church attendance did not decline and the number of atheists did not increase. Indeed, the percentage of atheists in America has stayed stead at about 4 percent since a question about belief in God was first asked in 1944. 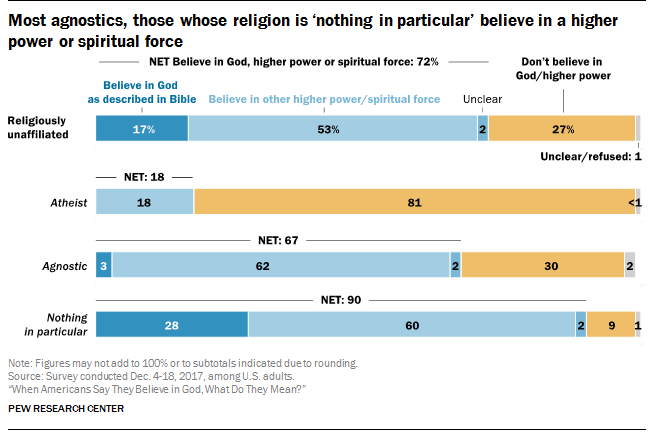 In addition, except for atheists, most of the other “nones” are religious in the sense that they pray (some pray very often) and believe in angels, in heaven, and even in ghosts. Some are also rather deeply involved in “New Age” mysticisms. 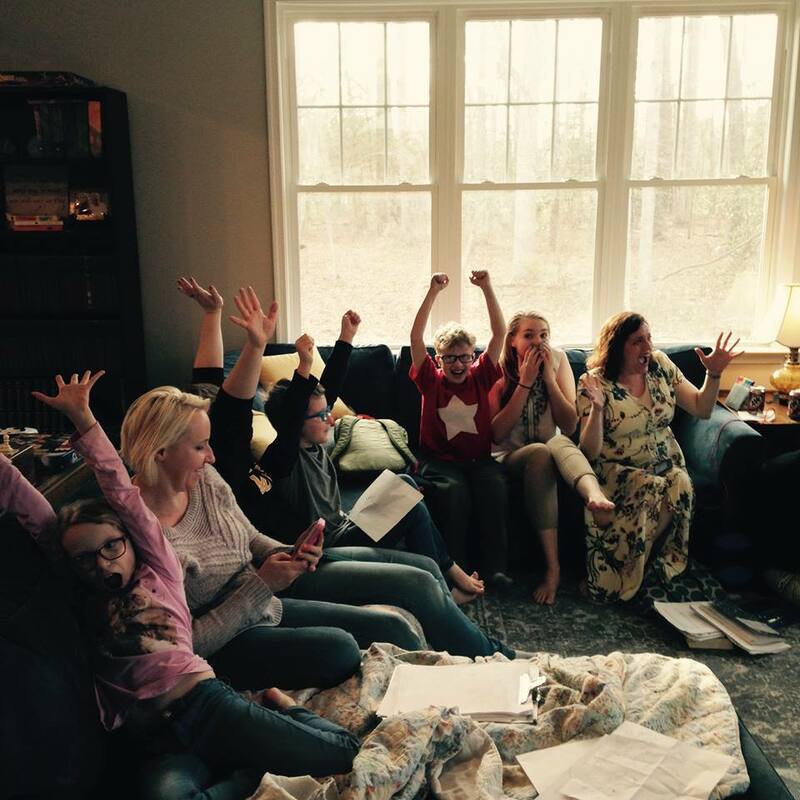 So who are these “nones,” and why is their number increasing–if it is? Back in 1990 most Americans who seldom or never attended church still claimed a religious affiliation when asked to do so. Today, when asked their religious preference, instead of saying Methodist or Catholic, now a larger proportion of nonattenders say “none,” by which most seem to mean “no actual membership.” The entire change has take place within the nonattending group, and the nonattending group has not grown. In other words, this change marks a decrease only in nominal affiliation, not an increase in irreligion. So whatever else it may reflect, the change does not support claims for increased secularization, let alone a decrease in the number of Christians. It may not even reflect an increase in those who say they are “nones.” The reason has to do with response rates and the accuracy of surveys. Immigration policy is controversial topic in 2018. In response to refugee crises and legal situations that can break up families, the LDS Church announced its “I Was a Stranger” relief effort and released a statement encouraging solutions that strengthens families, keeps them together, and extends compassion to those seeking a better life. This article seeks to shed light on a correct understanding of immigration and its effects. Walker Wright gives a brief scriptural overview of migration, explores the public’s attitudes toward immigration, and reviews the empirical economic literature, which shows that (1) fears about immigration are often overblown or fueled by misinformation and (2) liberalizing immigration restrictions would have positive economic effects. Walker Wright’s article on religious and economic perspectives about immigration, strangers, and refugees is marvelously timely. He approaches the debate over immigration through a double lens: the Church’s official statements and scholarly research on the economic effects of immigration. He demonstrates that the Church’s accommodating approach is overwhelmingly supported by the research. Migration is often impelled by external pressures, but it is ultimately the voluntary response of those fleeing to improve their lives. Immigrants come unassigned, so people can reach out to them without needing to be asked (pg. 5). Check it out. You can also access it on my Academia.edu page. Wright vs. Hart: Which Translation is Better? Where Wright is trying to translate the Greek of the New Testament (replete with its Greco-Roman and Second Temple Jewish valences) into modern English, Hart instead is attempting to translate the Greek of the New Testament (in all of its original “mysteries and uncertainties and surprises”) in modern English.